In the first week of December I got the chance to go to Kenya and visit the good people we work with there. I landed Sunday the 2nd in the evening in Nairobi and drove immediately Monday morning out to meet the management of the Kieni Factory. It was my first meeting with the people at Kieni but since we have been buying from them the last 3 years, Klaus, Casper and Linus have all visited them before, so I was received as a close friend. 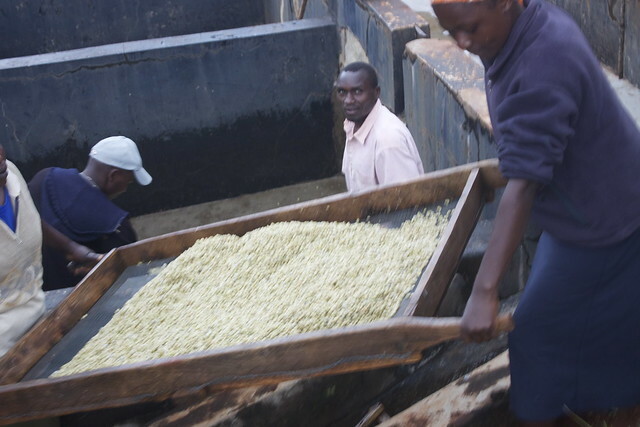 We love the coffee they produce at the Kieni factory for the very consistent quality, with distinct acidity balanced by a high sweetness and topped by wonderful black currant notes. A sublime Kenyan coffee. 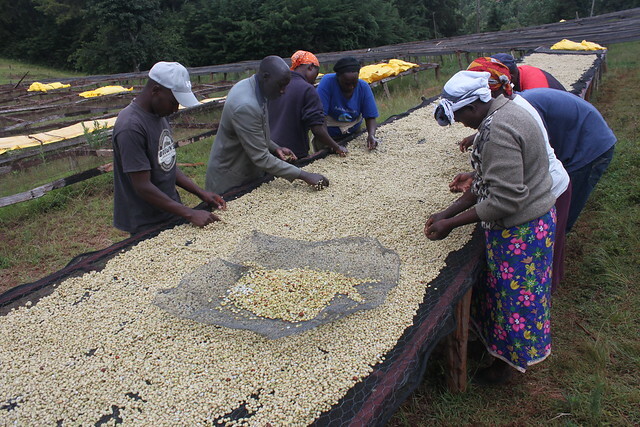 It has puzzled us for a long time how the good producers in Kenya makes coffee with such high and delicate acidity and quite distinct berry and/or floral notes. How much of it is owned to the SL-varieties, how much to the special Terroir and how much to the special fermentation going on there? As much as we love this type of very acidic Kenyans as black coffee, we see some limitations in its use for the type of light roasted espresso we do. Nevertheless we often use Kieni in either our espressoblend or even as SO espresso, since we love the aromas it brings. But the high acidity is challenging the balance of the espresso quite a lot. These things put together made us suggest to Kieni that we could try to do a small lot that did not stay in the fermentation tanks. We suggested to separate Mondays pickings into two parts: one part being fermented and washed as they would normally do and another part being depulped but skipping the fermentation tank and going directly to the washing channel. We made the promise to buy all from that day no matter how the project would turn out at the same prize as we would pay for the rest of the washed coffee we would buy from this harvest. The chairman of the Kieni factory Charles Mwai found the project interesting and agreed to get it started with the picking of the same day. 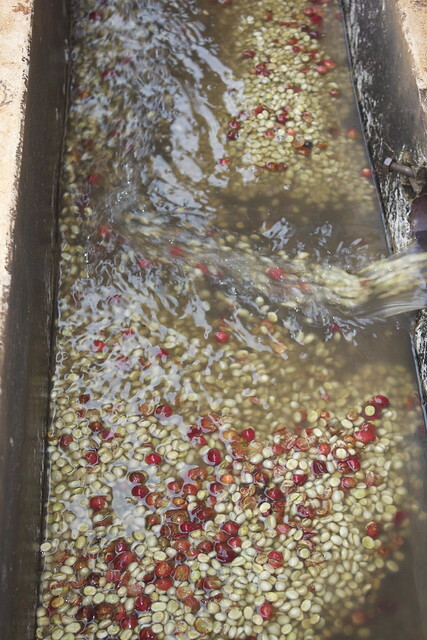 After depulping the coffee was transported directly to the washing channel. Here it was washed very gently to sort the pulp, unpulped cherries and light beans away. Even though the coffee in the depulper was sorted into the quality categories - Parchment 1 (the heaviest), Parchment 2 (medium heavy) and floaters, no step of sorting is perfect so even in the Parchment 1, which is what we use, there where quite a bit that was sorted away in the washing channel. 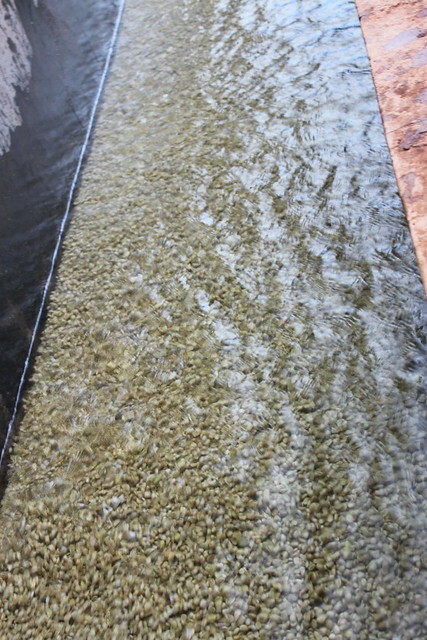 After washing, the parchment was gathered in the soaking tank where it stayed over night, well covered with water. Tuesday morning we emptied the soaking tank carrying manually the parchment to a drying table with a plastic net. Here it was turned around every hour the first day, to avoid the sticky mucilage to form lumps of parchment. From here it was to be dried as normal to reach around 11 to 10,5 % humidity. They did another round of the same kind of "semi-washed" coffee again the last week before Christmas, so that we have two replicates of the experiment. It will be very interesting to see how it will cup in comparison to the normal washed of the same days. We do not at all expect this coffee to take over from the normal washed procedure but more to supplement it. 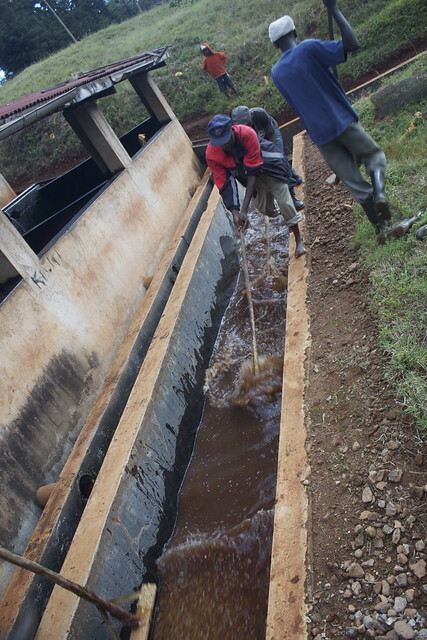 On top of the reasons we already have mentioned with post-harvest processing in the way described here (and called semi-washed since it seems to be the closed word to describe it), the process is saving quite a bit of water compared to the normal washed. We estimated it to use 1/3 of the normal washed and leaving behind less polluted water since some of the mucilage is not washed out in the water but stays on the parchment. Later Tuesday the farmers that are members of the factory started coming to the factory. They were invited for a meeting I didn’t know of. At the meeting it was announced that Kieni was the factory in the whole country that last year paid the highest price to the farmers for the cherries they had brought to the factory! Along with 2 other factories they had paid 74 ksh per kg of cherry the farmers had brought to the mill. This was fantastic to experience. Not that we can take the full honour for this but it is great to know that when we pay good prices to the factory for the work they do to create high quality as much as 93% of that is brought onwards to the farmer. Last year Kieni received around 530 tons of cherries. In rough numbers this converts into 100 tons of green coffee in parchment, which corresponds to around 70 tons of green coffee hereof 53 tons was Parchment 1 of which approx. 25% was AA. We bought roughly 2/3 of this at 500 usd/50kgs. Of which the factory needs to pay different taxes as well as their marketing agent and the dry mill (totals to approx. 9-12%). After this the costs of the factory are subtracted and it is these costs that the Kieni management kept at 7% (they are often 10-20% at other factories). The fact that Kieni kept management costs that low was important for the Kieni farmers to by the highest paid in the country. After this event I went to meet with two guests that would join me for the rest of the time in Kenya. Henrik Yde Andersen has bought Kieni from us ever since we started buying it and has served it at his restaurant Kiin Kiin in Copenhagen. Kiin Kiin is the only Thai restaurant in the world that has one Michelin star. Some time ago he decided to join me for this trip since he wanted to get deeper into coffee and develop the coffee concepts at his restaurants to new standards. Søren Frank on the left and Henrik Yde Andersen with the blue pullover on the right. Together with Henrik was Søren Frank the Danish wine expert and food writer. It was great being in Kenya with Henrik and Søren and showing them how the specialty coffee production works there in general and at Kieni especially. On one side I hope that the fact they went on this tour can help in bringing new standards of coffee in the top restaurants of Denmark (where the development, with a few exceptions, until recently has been extremely slow). On the other side it was fantastic for me to talk with such gastronomically competent people about the details of the coffee production. It was very enriching to talk about parallels to the production of high quality wines. Things like the basic inverse relation between per tree yield and quality in wine as well as how normally more sun exposure of grapes would mean more sweetness and more shade more acidity, as well as how wine trees are pruned and unripe grapes picked when they are still small to lower the total yield of mature grapes and thereby increase their quality are interesting to consider in relation to coffee production. The inverse relation between yield and quality will probably only be valid from a certain level of yield, which might be higher than where many farmers in Kenya are today (many has only 2-3 kgs of cherries per tree, whereas the better ones might produce 10 kgs per tree. 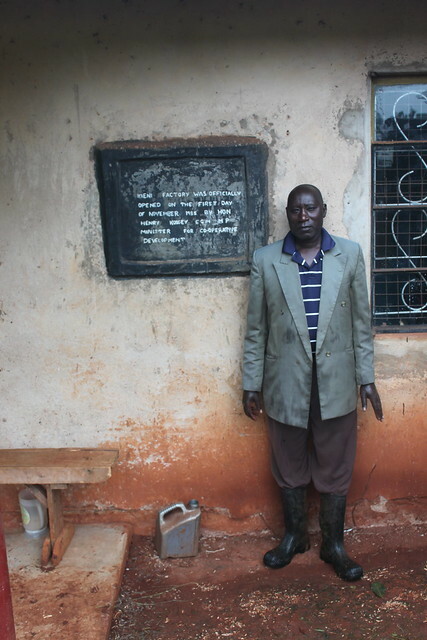 Agronomists in Kenya say that with the right care and fertilization 20-30 kgs per tree is possible). Also if it should make sense for any farmer not to increase yields the "lost potential income" thereby should of course be offset by a correspondingly higher price for the better quality. And even if the quality would be better it is generally speaking still very difficult for many farmers to get higher prices for better quality. As long as we don't know more exactly if this inverse relation also goes for coffee and to which extent and eventually at which levels of yields it might be relevant and as long as the extra payment for extra quality is still limited to access for the producers , the most rational development for many farmers will still be to increase their yields. Overall this was a fantastic trip. Having the company of Henrik and Søren was very inspiring. 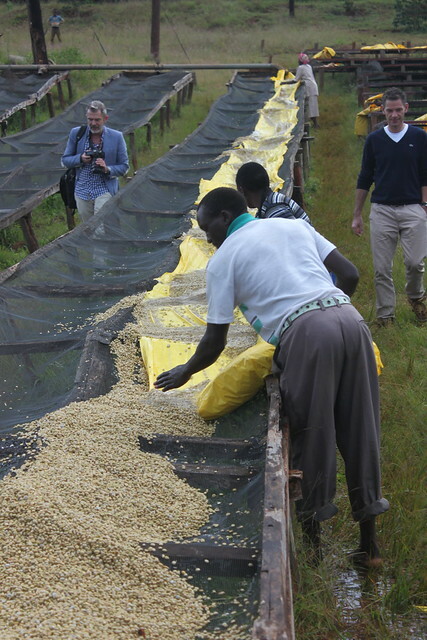 But most of all it was great visiting Kieni and see how our relationship has developed to a level where we can discuss possibilities for them to develop their production without them having any doubt that we will buy their coffee at decent prices. And to continue our relationship and not just be another set of white guys to give good advices on how they can do better without any commitments. Being able to have a continued relationship build on the bond that the better quality they deliver, the more exited we and our costumers get about it, the better the price we can pay back to the factory. And seeing that all this in the end can add up to the farmers of Kieni being the highest paid farmers in Kenya really hits something very deep with us.